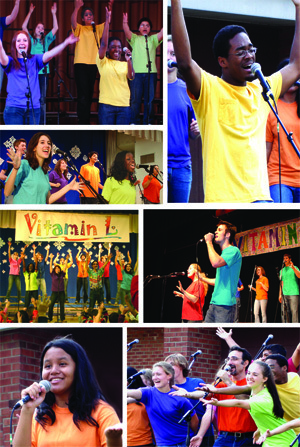 Every Year, Vitamin L inspires thousands of children with transformative messages delivered through the magic of song. 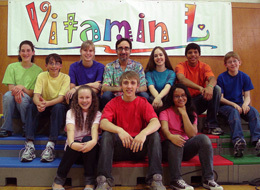 Vitamin L makes meaningful connections with children through music - inspiring them to grow into adults with personal integrity who treat others with dignity and respect. What is the Vitamin L Project? The Vitamin L Project encourages positive character development in young people through uplifting, inspiring music. 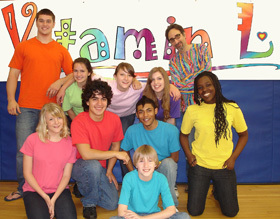 Vitamin L, based in Ithaca, New York, consists of song- writer Jan Nigro and a diverse group of 80 talented singers, ages 11-21. Nine singers join Jan in each performance. Seeing the young singers as role models, listeners absorb and integrate the ideas in the songs, including empathy, gratitude, appreciating diversity, endurance, human rights, friendship, and more. Today’s complex world calls for innovative methods and strong ideals. A Vitamin L concert delivers both. The impact of just one positive, memorable experience in a child’s life can lead to a lifelong desire to help change the world for the better. Vitamin L Can Be That Experience. Vitamin L can inspire your students to be young visionaries who can imagine a positive new future, learn how to bring it forward into the present, and then inspire us to create -- moment by moment -- the world we wish to live in. "Vitamin L encourages children to think about moral issues in a non-threatening, fun, and very personal way. By singing the songs and watching the Vitamin L concert, young audiences are exposed to seeing the importance of valuing positive character and moral behavior." We provide more than an entertaining assembly program! The music teacher receives CDs, songbooks, and a song list to teach the choruses of the concert songs in advance. 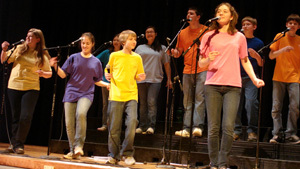 This creates opportunities for discussion and integration of the character-building themes in the songs. The art teacher can work with students to create posters and drawings reinforcing Vitamin L’s song themes to be displayed in the concert area or around the hallways. An energizing, inspiring concert which includes audience participation - singing, American sign language, and movement. 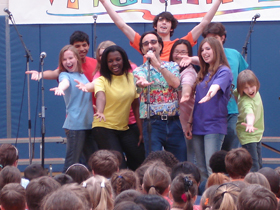 Classroom visits or a question-and-answer session with the performers. Continue incorporating Vitamin L songs into your character education efforts via the CDs, songbooks, and suggestions in the teacher’s guide. "The concert reinforced the character education program we work on all year. The students came away with the idea that it’s COOL to strive to be a good person. They loved it!" "The lyrics touch so many aspects of the students’ lives that in today’s world are ignored (justice, truthfulness, gossip, making mistakes). The songs had great appeal to all our students no matter what their culture or socio-economic background." "It was the most enjoyable school event I’ve witnessed in 23 years of teaching or administration." "The young age of the performers inspired my kids. It let them know young people can do great things." 2nd grade teacher, Poquonock School, Windsor, CT.
"The members are wonderful role models for our students. I just cannot express how much Vitamin L brings our school together! The songs teach such great values and are presented in such a professional manner that we can never seem to get enough!" "What an absolute precious, precious gift you are sharing with young people. I think if more young people had the opportunity from an early age to experience something like this, the world would be a very different place." Yolanda King, late daughter of Dr. Martin Luther King, Jr.
You can afford to bring Vitamin L to your school! We make year round efforts to procure scholarship funds to help schools when needed. "I’ve been a music teacher for 32 years and I’ve never seen a program that has captured and encompassed every age level so deeply. You’re such a worthwhile investment!!!!" for song samples, newsletters, and more!